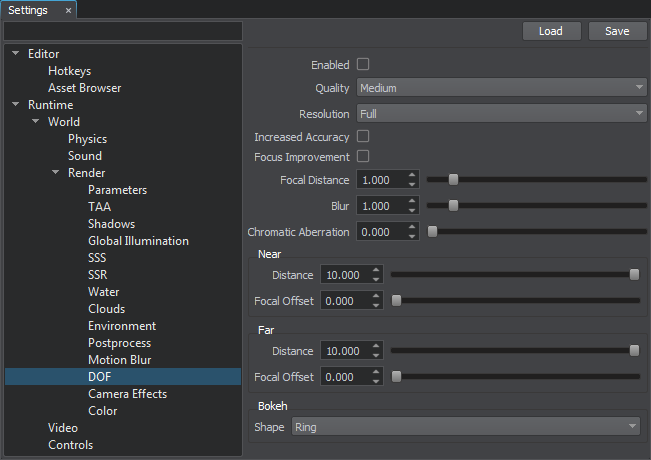 This section contains settings used to control the depth of field (DOF) effect. To enable the depth of field effect, use the render_dof console command. Can be controlled by render_dof_quality console command. Can be controlled by render_dof_resolution console command. Enables increased accuracy for DOF effect. Enabling the parameter allows for increasing accuracy of focusing calculation. Can be controlled by render_dof_increased_accuracy console command. Enables the focus improvement for DOF effect. When enabled, transitions between the focused and unfocused parts of the scene become more accurate. Can be controlled by render_dof_focus_improvement console command. Specifies the intensity of the DOF blur. Sets the intensity of chromatic aberration effect. Specifies the distance from focal to the most blurred zone to near. Black zone on the DoF mask means in-focus zone. Specifies the offset from the focal to the nearest blurred zone. Specifies the distance from focal to the most blurred zone to far. Specifies the offset from the focal to the farthest blurred zone. Can be controlled by the render_dof_bokeh_mode console command.